Hot Eats and Cool Reads: Cream Cheese Chicken, Mushroom and Corn Mini Pot Pies plus Mini Baker Stoneware from Crafts Direct! Cream Cheese Chicken, Mushroom and Corn Mini Pot Pies plus Mini Baker Stoneware from Crafts Direct! Thanks to Crafts Direct for sponsoring this post! Hey everyone!! I hope y'all had a fabulous Thanksgiving weekend! 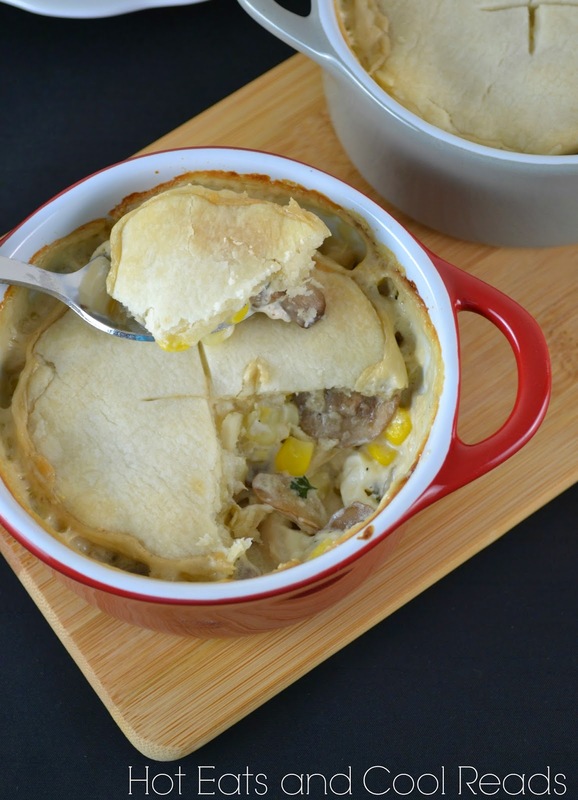 Today's recipe is for these amazing Cream Cheese Chicken and Vegetable Mini Pot Pies! These potpies are total comfort food, and they're ready in a breeze using the fun Mini Bakers from Crafts Direct! They're a locally owned business here in St Cloud, Minnesota and they recently opened their website up for ordering. Remember when I posted about them a couple months ago? You can check that out that post along with the recipe for the Individual Egg, Hashbrown and Sausage Breakfast Bakes here! These Mini Baker Stoneware make absolutely perfect Christmas gifts!! There are 9 different colors to choose from, and Crafts Direct also has platters that go with them, You can mix and match to make some fun color combos for any holiday or party! I personally love serving dips in them, or using them in the oven to bake up some great winter recipes, like this pot pie. Each one measures 6.25" wide x 3.5" high - 4.5" wide x 2" high inside and holds approximately 2 cups! They are 100% stoneware. 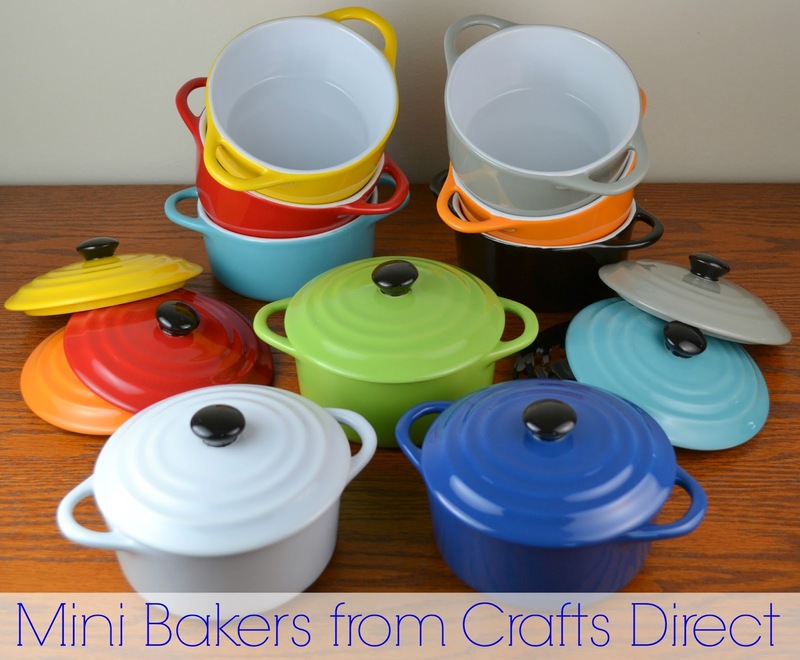 These Mini Bakers are also microwave safe, so perfect for storing and re-heating leftovers. The handles even stay cool in the microwave! They are so convenient and multi-purpose! Crafts Direct is once again is giving Hot Eats and Cool Readers a promotion code for 20% off purchases on their website from now until December 15th. Use promotion code HECR20 when checking out. This is the perfect time to get some Christmas gifts ordered for those special friends, family members, college students, or even teachers! I hope you'll stop by and check them out! Crafts Direct can also be found on Facebook, Instagram, Twitter, Pinterest and their Blog! Their store can be found at: 620 Sundial Dr, Waite Park, MN 56387. Now for the amazing Cream Cheese Chicken and Vegetable Mini Pot Pies! This recipe comes together quickly, especially with using cooked chicken and refrigerated pie crust. I love easy when it comes to mealtime! The cream cheese adds an amazing flavor, and I picked mushrooms and corn as veggies, for a nice and hearty meal. One mini pot pie fills me up perfectly. This is such a great winter meal! Make sure when your Mini Bakers get delivered, stop back and try out this recipe! In a large saute pan, melt butter over medium high heat. Add mushrooms and onions, and saute for 4 minutes. Add chicken and corn, and saute for an additional 2-3 minutes. Reduce heat to medium and add the cream cheese and milk. Heat until cream cheese is melted, stirring often. Mix in the fresh parsley, and season with salt and pepper, as needed. Remove from heat and spoon the mixture evenly into four Mini Bakers. Using a Mini Baker cover, press four circles into the refrigerated pie crust. Use a knife to cut out the circles and place one on top of each mini pot pie. Press slightly into the chicken mixture and use the knife to cut an x into each piece of pie crust. Bake for 25-30 minutes, until bubbly and crust is browned. I love those little bowls! So cute! Love those mini bakers!! I may have to get them--very cute! The mini bakers are so cute and the recipe looks delicious! This sounds great and I love the mini bakers! Those mini bakers look perfect for individual meals. I really need to get some of these. The pot pie looks so good! I'd love this for dinner. Oh sweet mama, that looks so good! Those little mini bakers are just too cute, too! these pies look good and I am going to have to buy some mini bakers. I love those! Buying a blue one ;o) So cute! Pinned it! I am DYING over these little dishes. So cute! These are beautiful! And they look so good in those cute colorful dishes! I want them all!! Those mini bakers are so cute! Love the recipe, looks great! Love the recipe but those mini bakers are awesome! I love those pots!! I need one in every color, and I love supporting MN businesses, woohoo!! Those little mini bakers as so cool. You made a wonderful meal in them too! I was just thinking about how I needed something like this! I love how cute and colorful they are! I want to eat these mini pot pies for dinner tonight! They look delicious, and are so cute! The mini bakers are great - what a fun presentation! 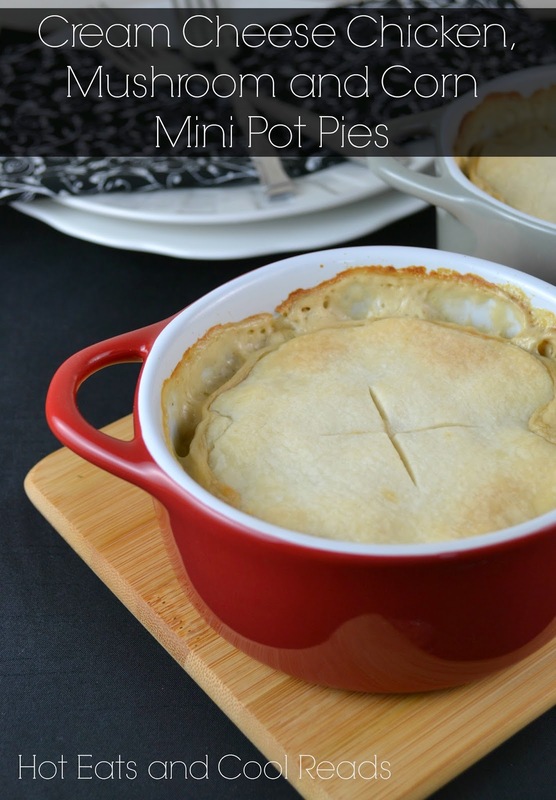 I love pot pies, especially when they come in adorable mini bakers like that! I'm in love with all of the colors, I need them! I love those little mini pots! So cute!! Thos minibakers are absolutely adorable! And the recipe is so good, I need to try this! I may just have to add some of those little bakers to my Christmas list! They look so cute and practical, and the pot pies look delicious too! How cute! I would love to have those mini bakers, they are adorable! How cute are these? Love all the colors. I'm going to have to check out their website! Delicious pot pie in a totally adorable pot! Love it!! Im in love with those darling stone ware pots, and I love that they are local to you! Great recipe too! These pot pies look look so delicious and comforting and I love the stoneware! Mini Pot Pies! I think I'm in love!